It is based on the question of how to bring out a koi’s potential beauty as much as possible? The answer is that it depends on water quality – we need the water in the pond to be the same quality as mud pond water. With this in mind, we succeeded at making “Japanese mud pond water” with a special material composed of Japanese minerals. Koi are moved from house ponds into mud ponds from the beginning of May each year. 1, To promote koi growth in such a vast surrounding. 2, Avoiding heating too much during summer. 3, Keeping the koi in water that includes many minerals so that the koi skin will be bright. There are other reasons but we aimed at those above and started to develop new products based on them. We believe that koi feed on zooplankton and phytoplankton, and that plankton naturally contains minerals. One of the strong points of keeping koi in mud ponds is that mud pond water includes plankton, which has plenty of minerals, making it the best environment for koi. What’s more, the minerals from the mud itself, are also very important for koi. On the basis of the above, we aimed to add minerals into pond water, to make pond water the same quality as mud pond water. varieties improved. This was even though we developed Mineral plus not for SUMI, but for it to produce the best environment by improving water quality. In fact, the skin of many of the koi turned out to be brighter and polished once the koi breeder added Mineral Plus into their ponds. We would love for you to use our Mineral plus for making your koi more beautiful. I give you one story. can live by virtue of harmonious mineral. The lecturer told us that they used artificial seawater for coral culture. Seawater is comprised of salt, calcium, magnesium, potassium, iron, molybdenum, to name just a few components. That is to say, seawater is made of salt, and a lot of minerals. When even just one of them is lacking from seawater, then the coral cannot grow well. Humans and koi were born from seawater (all livings have roots in the sea) and we need to know that minerals are very important for all. After all, why are organic vegetables better for us? Once you consider this, you begin to observe that we need minerals to breed beautiful koi. From the lecture I could understand how humans and all living beings were born from the sea, and I learned that once we unbalance the minerals, we would get sick easily and find it hard to keep healthy. Today we see many advertisements on TV for beer and drinking water which emphasize “MINERAL”. I also heard at the lecture that amniotic fluid in mothers and the fluid in our tears, is the same as seawater quality. From this experience I developed Mineral. As you know, after koi harvest, the koi are more beautiful and bright! So why is it difficult to make koi beautiful and bright in concrete ponds, the same as koi from mud ponds? It is due to the amount and varieties of minerals present in the water. assimilate. Koi cannot make minerals in their body. The minerals work on mitochondria, improving the immune strength of the koi. This helps koi to stay healthy and prevents any diseases. Ionized minerals are taken into the koi from mouth and gill and pulsed blood. Blood including these minerals is sent throughout the body. Each cell has a mouth and vent and cells take minerals and oxygen into the mouth and discharge waste from vent. If a koi has a lack of minerals, it would be weak and get sick easily. Once there are enough minerals in water, the koi’s mucus cell and pigment cell would be active, resulting in bright and beautiful colors. The koi are able to keep in this better condition for longer. Our new product acts very much like a medicine. 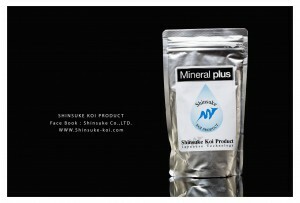 Mineral plus also contains a special element from the mud, and it is our top secret, very special element. We are proud of our revolutionary Mineral plus. The powder mineral of Mineral plus is dissolved by an organic acid that occurs in pond water. An organic acid occurs when waste decomposes into an inorganic substance. Once an organic acid occurs, the pH falls. There is no pond water that is increasing pH naturally. the water hard. Hard water tears mucous membrane from a koi’s skin and the koi’s skin is worn to rags. The best materials to maintain pH levels are Bio Sponge and Bacto Power !! 1: please put 5-10g of Mineral plus into 1 ton of water, once every one or two weeks. 2: Add a little water and make a ball with the Mineral plus. Please put the ball into the final stage of the filter. 3: Please put some Mineral plus into a bag and hang it in the final filter and shake it once a week. Note: If you have something wrong in your pond, please stop using Mineral plus straight away. Water quality is different in each area so please adjust the quantities as needed.